Outdoor metal needs to be protected from the elements. 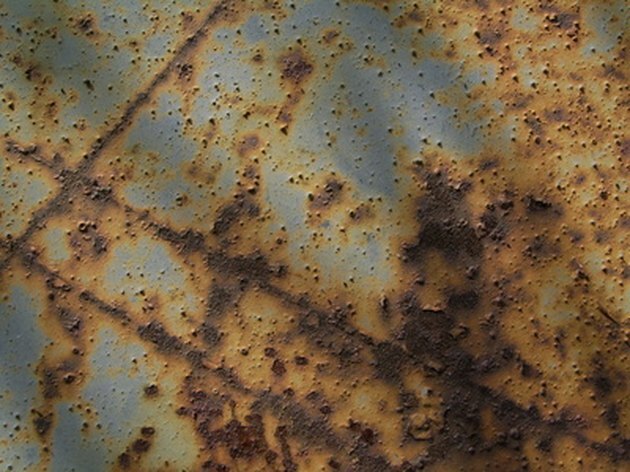 If a piece of exterior metal wasn't painted properly the first time, or is just very old, the paint will chip and peel away as the metal begins to rust. Painting outdoor metal is not difficult, but you must use the right kind of paint made specifically for the outdoors. The metal needs to be primed with anti-corrosive primer and painted with rust-proof paint for metal surfaces. Scrub away all rust, existing paint and dirt with a wire brush and steel wool. Then sand the surface with a power sander. The surface of the metal must be clean and smooth before you prime and paint it. Lay a drop cloth under the metal to keep paint from getting on the ground. Tape off any areas you might not want paint to get on, using painters tape. Hold the can of metal primer spray paint 6 to 8 inches away from the metal and evenly spray over the entire surface. Refer to the instructions on the can for the number of coats you should add and drying time. Hold the can of rust-proof spray paint 6 to 8 inches away from the metal and evenly spray over the entire surface. Refer to the instructions on the can for the number of coats you should add and drying time.